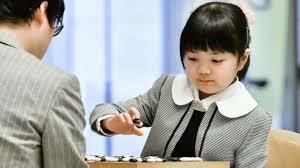 Ten-year-old Sumire Nakamura will become the youngest professional go player on April 1. She began playing at the age of three and was competing in national tournaments in Japan by the time she was seven. The previous record was set by Rina Fujisawa, who was 11 when she became a professional player in 2010. “I’m happy when I win,” the Osaka schoolgirl told a press conference in Tokyo on Saturday. “I want to have a title while being in junior high school.” When Cho U, one of the leading players, faced off against Sumire last month to gauge her skills, the child prodigy stunned association officials by holding the 38-year-old pro to a draw. “She proved to be a lot stronger than I had imagined,” said Cho after the game. “I played with Iyama when he was in elementary school, but I am under the impression that she is better than he was back then.” She is the only child of professional go player Shinya Nakamura 9P, 45, and wife, Miyuki, 38, a former go instructor. When she was 7, her family moved to Seoul for Sumire to undergo go training, traveling back and forth between Japan and South Korea. 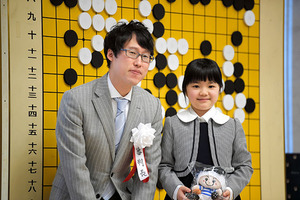 The Nihon Ki-in announced Jan. 5 that it will accept Sumire, an Osaka fourth-grader, as the first pro under a special program for elementary school go players “with the potential for becoming the world’s No. 1.” After Japanese players had lost world titles by 2005, an alarmed Japan Go Association set up the program to allow extremely gifted children to play as a professional without requiring them to pass a pro test.